Masayoshi Son, chairman and chief executive officer of SoftBank Corp.9984.TO -0.09%, waves and shakes hands with the robot Pepper during a news conference June 5. Shortly after Tesla Motors TSLA +0.79% and SpaceX chief executive Elon Musk spoke of the need to be wary of “Terminator”-like outcomes from artificial intelligence, another tech visionary stressed the power of robots to spread love, joy, and peace. 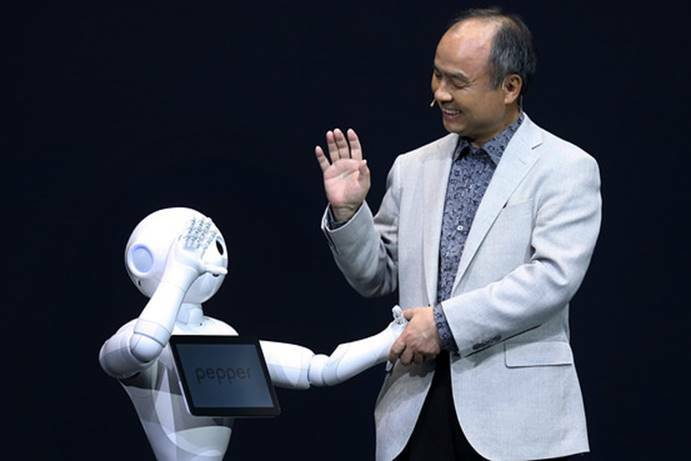 Softbank Chief executive Masayoshi Son invited the Japanese firm’s emotion-sensing robot Pepper onstage during the annual general shareholders’ meeting Friday. The two competed on tongue-twisters, with Pepper rattling off a tongue-twister 100 million times faster than Mr. Son — and getting some laughs for it. “This is a robot that can love,” Son said. It is a cliche that Japan has more of an affinity for robots than western countries. And like most cliches, it is probably wrong. Yes, Japan has its share of evil robots in movies and manga (Mechagodzilla, anyone? ), just as there are plenty of lovable, quirky robots from Hollywood. But the contrast between Mr. Musk’s view on artificial intelligence and Son’s is striking. Pepper is becoming a familiar presence by Son’s side at news conferences, and is now employed at SoftBank stores in Tokyo’s Omotesando and Ginza shopping districts. The warm-hearted robot has gained access to Mr. Son and his operations that this reporter can only envy. Is Son so naive about the future of human-robot relations? Or is Musk too cautious? Other than robots, Son focused much of his presentation on SoftBank’s potential for growth in the U.S., where it bought wireless carrier Sprint S -0.59% last year. He reiterated SoftBank’s aim to bring price competition to the market and to make U.S. networks faster and cheaper. Tadashi Yanai, chief executive at Fast Retailing 9983.TO -0.19% and an outside director at SoftBank, also hinted at further developments in the U.S.